Get in touch and see what services we offer large parties for corporate or personal use. We look forward to hearing from you! At Rendezvous we utilise both local and authentically sourced ingredients, all freshly prepared on the premises to ensure high standards of quality. The exten- sive menu features a strong focus on traditional meze dishes, beautifully and uniquely presented. Meze is food that reflects a certain way of life and culture. It describes an eating style ancient in origin and favoured in Turkey and the Mediterranean where eating is about hospitality and celebration. The menu includes a substantial selection of starters and main courses with nu- merous vegetarian, fish and seafood options. We also provide an assortment of banquet meals suitable for all occasions, from a romantic meal with your loved one to a large corpo- rate event. The banquets provide an array of dishes appropriate for all palates, even those with a more selective disposition. As our policy is to maintain quality and customer satisfaction, if you do not see it on our menu - just ask and we will try to accomodate your request, but with prior notice we will strive to indulge! Since the foundation of the original Nargile in 1983 we have strived to achieve a wine list that both matches our food and reflects current trends and developments in the wine world. We have chosen wines with a Mediterranean influence rather than strictly Middle Eastern wines in order to appeal to the enthusiast and also the customer who just wants a good bottle of wine with their meal. 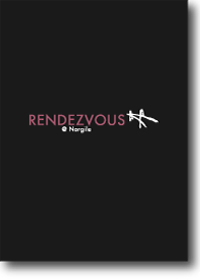 Throughout every part of the menu we have worked with our wine merchant to really break boundaries but keep the essence of what Rendezvous @ Nargile is all about. We have wines from Lebanon, Chile, South Africa and many more countries which all have some- thing that will add to the enjoyment and satisfaction of your meal at Rendezvous.